Festive greetings to all readers. 2014 will be an important year in Barnet and I will remain as vigilant as ever in my scrutiny of Barnet Council. This song says it all. Last night's Constitution & Ethics committee demonstrated perfectly how a change to the governance system is an utterly pointless exercise. I spoke out about the proposal to cut speaking time at committees from 5 minutes to 3 minutes and to allocate a total of 30 minutes for both questions and speakers. I made the point that if the council read the consultation results they would see there is an strong appetite for more public engagement but that by restricting time given the public it would have the opposite effect. I also made the point about unintended consequences. Two and a half years ago the same committee made the decision to restrict what questions could be asked at residents Forums. The consequence of that was that far more questions were asked at committees. Squeezing time for questions at committees will simple force the public to ask their questions elsewhere. The committee then moved on to discuss various aspects of the changes to the governance system and changes that would be required to the constitution as a result. Cllr Melvin Cohen insisted that the title of Committee Chair be changed to Chairman. Objections from Cllr Alison Moore that the title would be offensive to women were dismissed. Indeed Cllr Joan Scannell said "I am a lady and I am not offended" to which Cllr Moore replied I may not be a 'lady' but I am offended. Put to a vote the Conservative group voted through the change through using Cllr Cohen's casting vote. And so it went on, objection from Libdems and Labour out voted by Conservatives. Towards the end of the meeting we came to the subject of public participation. A little debate with Cllr Quigley-Turner ably demonstrating that he hasn't got a clue how the current system of public questions works. I did shout out at this stage that he didn't know what he was talking about and Cllr Cornelius had to gentle tell him that the point he was making actually didn't happen. So nice to see Cllrs making decisions unfettered by a grasp of the facts. Yet again Cllr Melvin Cohen used his casting vote to push through the cuts to public engagement after which the meeting drew to an end. The Council say that by moving to a committee system will make it more democratic. Last night's committee showed that the current ruling group will always vote on party lines and a change to a committee system will not change a thing while the ruling group can out vote any dissenting voices. I predict the new system will be a catastrophic disaster, no clarity as to which matters get debated at which committee, lack of clarity about precisely what decisions a committee can make and what will be referred to the all powerful Policy & Resources Committee conflict and rivallry between committees and lots of reports and votes at Council. This is all about jobs for cllrs along with a lot more special allowances for so many more committee Chairpersons. Last week I saw a very interesting FOI request on the What Do They Know website submitted by Joel Benjamin. It relates to the advise provided to Barnet by financial advisors regarding the investments in the Icelandic banks. As we all know Barnet took a bath for £27 million and although they have recovered some money there is still money that may take years to return to Barnet's coffers. "This schedule was developed by Capita to address a contract consideration and reflects a detailed approach within Capita to manage conflict of interest considerations. This forms part of the Capita business systems and therefore was provided in confidence as part of the evaluation process, and should not therefore be disclosed." I would like to thank Joel Benjamin for bringing this matter to all our attention but I am seriously worried that we will never hear anything . Democracy in Barnet has been outsourced and we are all the poorer for it. 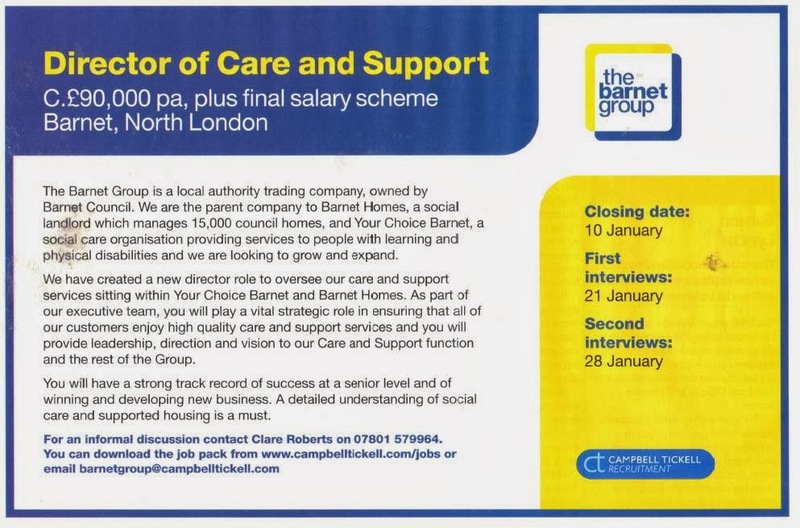 Thanks to an eagle eyed resident who spotted this job ad for the Barnet Group, a wholly owned subsidiary of Barnet Council covering Your Choice Barnet (YCB)and Barnet Homes. Common sense tells me that the best way to care for people is to employ staff who are well trained and motivated to deal directly with those who require the service. A couple of weeks ago YCB announced they were cutting care staff allowances for working nights, weekends and bank holidays. That doesn't help motivate staff or enhance staff retention and ultimately leads to worse care for recipients when there is a rapid turnover of demotivated staff. Spending £90,000 a year plus £30,000+ on-costs on a Director to ensure "that all customers enjoy high quality care and support services" doesn't seem to be the right solution. Perhaps the giveaway is in the penultimate paragraph where it says they are looking for someone who can generate new business - a salesman in other words. Perhaps a title Director of Sales would be more appropriate - stuff the care follow the money. Jackson Road is a delightful road of old railway worker cottages in the heart of East Barnet Village. Back in 2011 a planning application was submitted for a 3 storey block of flats behind 69 Jackson Road. Almost two years after that planning application was submitted to the Council further planning applications have now been made for 3 and 4-storey blocks on the same land. When the last application was made (November 2011) for a 3-storey block of flats - around 50 objection letters to the plan were received by Council. The Councillors on the area planning granted approval - 10 votes for with 2 abstentions. Not one Councillor voted against the plan - despite the weight of objections. Cllr Joanna Tambourides, one of the East Barnet ward Councillors, who sat on that planning committee abstained in the vote. Is this the same Councillor who expressed strong objections - along with her ward colleagues Cllrs. Robert Rams and Barry Evangeli - to the Cat Hill development (not actually in their ward)? Yet what is their position on this development? The 3 ward Councillors (CONSERVATIVE) have all been sent an e mail asking for their support against this development . Only Cllr Tambourides replied but when asked as to why the initial planning application had been passed when there were 50 objections from local residents she did not give a reply. Some residents are wondering why they are being sent letters again from the Council for these plans (Refs: B/05238/13 & B/05234/13) when their original views - listing thirty specific objections - were classed as ‘not relevant’. In the event that these planning applications are approved - at the proposed height (i.e. >20 metres) - they would overshadow a number of homes in Jackson Road and Churchmead Close, and effectively cut out sunlight and destroy wildlife. There is also the small matter of the Thames Water main foul water sewer for East Barnet running diagonally below this land, which our local Councillors appeared unaware of. If you are against more major development on or around Jackson Road which is already built up and unable to accommodate any more cars as well spoiling an architectural and historic part of East Barnet, then say no. Money for consultants and new bin lorries but not for the elderly or disabled? Barnet's October supplier payments are out and as readers will know I read through them carefully. The bin lorry saga continues. Last month Barnet put through £2million worth of invoices for the new bin lorries. I requested these invoices under FOI and found that this was only a PART PAYMENT. This month a further £4 million of invoices for the new bin lorries was put through and I understand there may be another £2million worth of invoices still to appear. Some have said that we had to buy new lorries because the old contract had come to an end. However it is common practice to purchase usable equipment at the end of a contract for a written down value. EU statistics in 2011 showed that the average age of heavy duty vehicle fleets has increased to 11.5 years. People are running their cars longer and to my mind that seems like a sensible strategy so long as the vehicles remain reliable. However the culture in Barnet seems to be spend, spend, spend if there is a budget for it. That is neither frugal nor prudent. And speaking of spend, spend, spend, our friends at Agilisys received a rather sizable £198,947.40 whose bill for implementing One Barnet is now over £8 million. I would have thought that now the One barnet contract has been let we would have seen an end to this massive spending but clearly that is not the case. Legal advisors Trowers & Hamlin billed the council £385,648.74 in October, long after the judicial review is at an end, so I wonder what this is for? And as for Capita or RE Ltd to give them their Barnet DRS trading name, they billed a cool £5,177,323.95 in October. When this contract was being discussed I specifically asked if Capita's bill would be broken down or whether we would simply get a single massive bill for their charges. Well yet again I was misinformed, misled or otherwise deceived into believing there would be complete openness. With two massive outsourcing contracts in place I had foolishly assumed that the bill for agency and interim staff would have come down. Not in Barnet. In October the Council spent £1.22 million with Comensura who handle all temporary or agency staff payments yet at the same time hundreds are staff are in the process of being made redundant. This seems utterly wrong. All of these massive payments need to be set in the context of the cuts that are taking place to adult social care and children's services. Anyone who watched the report from the Task and Finish Group into the changes taking place at Your Choice Barnet cannot failed to have been moved by the plea to reinstate services for those with real needs yet we are still wasting vast amounts of money on professional fees.